Dentists prescribe fewer antibiotics after they receive a personalised report detailing their past prescription rates, according to research from The University of Aberdeen. 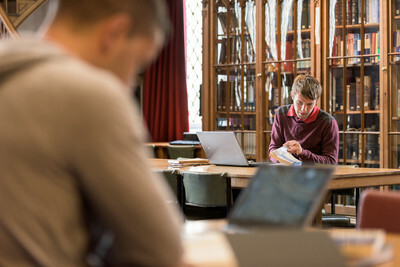 The University of Aberdeen has been awarded a £1.2 million endowment by the Kirby Laing Foundation to fund postdoctoral research in New Testament Studies. The University of Aberdeen is leading the way in this year's Converge Challenge which offers up a £150,000 prize to the winner. Academics from across the world will gather at the University of Aberdeen's Oceanlab research station for a workshop focusing on the impact of climate change on Arctic marine ecosystems. Happy Birthday to the 1936 Birth Cohort! The University of Aberdeen welcomed scores of octogenarians to a party in Elphinstone Hall this week (August 24) to celebrate the birthday of the 1936 Birth Cohort. An academic from the University of Aberdeen will be awarded a prestigious prize from the British Society for Neuroendocrinology next week. A computing scientist from the University of Aberdeen has released a book that uses computer algorithms to shed light on a fundamental aspect of human communication. A new study into the treatment of gallbladder stones - conditions which lead to around 80,000 operations a year in the UK - is being directed by Professor Irfan Ahmed of NHS Grampian and Professor Craig Ramsay of the University of Aberdeen. Scotland's new land reform laws will come under scrutiny at a unique conference taking place at the University of Aberdeen on Friday (August 26). Can eye movements diagnose psychiatric disorders like depression or schizophrenia? The School of Psychology at the University of Aberdeen has been officially recognised for its efforts to advance gender equality - becoming the first of the University's Schools to hold an Athena SWAN Bronze Award. Professor Sir Ian Diamond has welcomed a guarantee from HM Treasury that protects future European research funding and will allow UK universities to continue to bid for funding while the UK remains part of the EU. A team of academics from the University of Aberdeen has entered the NRG COSIA Carbon XPRIZE, a global competition that challenges teams to develop technologies to convert carbon dioxide into valuable products. A University of Aberdeen student is working with the Qatari Government to develop a new traffic lights system that aims to significantly reduce traffic build-up and associated CO2 emissions. Student satisfaction at the University of Aberdeen has gone up for the second year running in this year's National Student Survey (NSS). Two Aberdeen medical students have won a prestigious national competition after they developed undergraduate care manuals for pre-hospital care. Four athletes with a University of Aberdeen connection are preparing to make their mark in Brazil when the Olympic Games and Paralympic Games get underway in Rio de Janeiro on Friday. People with a thirst for knowledge can still sign up to take part in the University of Aberdeen's free online Nutrition and Wellbeing course which begins next month (September 5). A University of Aberdeen PhD graduate has been awarded a prize by the Royal Society of Chemistry which recognises 'a young scientist judged to have made a major contribution to analytical atomic spectroscopy'. Britain's oldest surgical Royal College has awarded one of their highest honours to the University of Aberdeen's Emeritus Professor Rhona Flin.